When you are out in the wilderness or even out in a combat zone your knife may just be your best friend. It is an old saying, but true nonetheless, that knives do not jam, do not run out of ammunition or batteries and do not stop working when they are wet. Few other survival tools out there are as versatile and important as a good blade. The simple truth is that with a blade you can build a shelter, light a fire, cut yourself free from wreckage or cut a path through impenetrable jungle. You can defend yourself or clean a fish. It is hard to think of any task that you may need to do to stay alive that does not involve a blade. Sure you can try to construct one from bashing a flint and making blades or spear-heads (I’ve tried and it is possible, but you could spend all day getting nowhere unless you’ve been taught) but you vastly improve your chances of surviving if you have one with you at all times. Now a lot of people will try to sell you blades for hundreds of dollars. I’m sure that beautifully crafted hand-made knives are hard to beat. But if you are on a budget, what you want is a good, solid hunk of steel with a decent metallurgy and good design from a reputable firm that doesn’t force you to mortgage the house. And on that front, most Gerber survival knives deliver. Gerber’s LMF II is no exception. 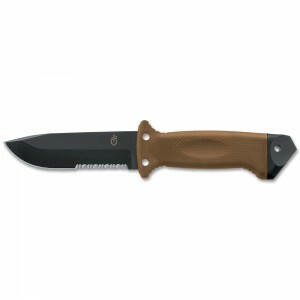 Gerber makes pretty big knives and the first thing you will notice about this knife is its size and heft. It is a full 10 inches so you have a lot of blade. In fact, for some it may be too much blade. Luckily Gerber’s little brother to this Big MF Knife is also great. This is a solidly styled survival knife that will stand up well as a utility tool as well as in combat situation. Its tip is solid so you can pierce drums and other hard objects with it, should you need to do so. Its Buttcap is also pointed and hardened and will allow you to smash your way through glass or perspex should you need to break out of a downed chopper or light aircraft. I’m not a huge fan of serated edges on combat knives but they do have their uses, and this will both cut through webbing as well as saw through aluminium and other thin metal such as the roof of an automobile. What makes the buttcap esspecially smart is that it is mounted separately from the tang, so you can hammer away without the shock going right up your arm. This makes the Gerber LMF knife a lot more useful for hammering than most other ones with a ful tang that goes all the way up through the buttcap. It has a really solid handle that won’t slip, even if your hands are wet or muddy or covered in gore, should you be butchering game animals. The sheath doesn’t stand out too much and has a built-in sharpener so you won’t get caught out in the field. It also has lashing holes so you can make a spear. Gerber generally makes pretty good knives so there is not a lot to fault. The only thing I can say against it is that it is pretty big and heavy. You may want that and in some circumstances you need the heft of a tool just such as this. Personally I prefer slightly smaller blades that can be tucked away more easily.